This is a novella (approx 100 pages) about Tenzin, one of the main characters from the Elemental World quartet (A Hidden Fire #1, This Same Earth #2, The Force of Wind #3 and A Fall of Water #4). Elizabeth Hunter published this story two years after she had completed and published the Elemental World series and so I actually think this should be read after you’ve read them all too, in fact, I think this story could also work as a stand alone tale. 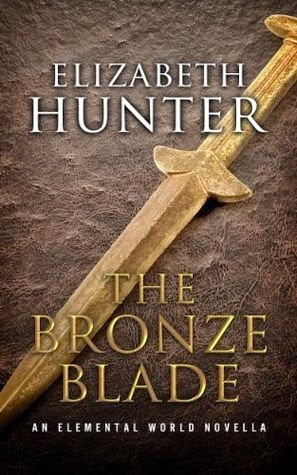 I am already a fan of Ms Hunter; her writing style, the characters she creates, and the way she unfolds her stories to us. This book didn’t let me down. Reading this story, I felt transported to the pre-historic steppes, the way people lived; their priorities, hopes, fears. I feel that The Bronze Blade is a story more about Tenzin’s emotional and mental change from human to vampire rather than just her physical metamorphosis. I loved that! I liked getting into her head in such an all encompassing way. This story gripped me from start to finish and yes, a few tears did fall on a number of occasions. I loved this book! I was already completely enthralled by Tenzin so this brief insight into her beginnings only added to my love for this amazing female character. But be warned, this story does contain many scenes of graphic violence and horrific abuse, so it’s definitely an “adults only” story!